Forget the rest, you've found the best! Very rare historic La Jolla Beach Cottage in an incredible location. Wonderful ocean views await and the beach is just steps away from this beautifully finished vacation home. The home is on Ocean Lane between Coast Boulevard and Prospect Street, right in the very heart of the Village of La Jolla. Step inside this 1930's era beach cottage and prepare to be impressed. Some of the highlights include hardwood flooring, a wood finished cathedral ceiling offset by remote controlled skylights that open for a sunroof effect. Bay windows offer dramatic ocean views from the living room, dining area and the master suite. Off the master suite is the bathroom with tub and shower combo that features a steam shower, Jacuzzi tub and one–way privacy glass, so you can take a nice warm soak while gazing at the waves just off La Jolla Cove. The kitchen is fully stocked with all the cookware, appliances and dishes needed to prepare your favorite delicious meals, along with plenty of counter-space and period inspired Northstar refrigerator and Convection oven. In the living room there is a gas fireplace to warm the evenings along with a comfy couch where you can relax and watch your favorite shows on the flat–screen HDTV, included with HBO. Or if you'd like to spend a lazy day in bed, you have the choice to watch a show on the flat–screen in the master or be relaxed by the ocean views! Guests at Casa de las Olas can take a brief stroll down to the ocean and La Jolla Cove. Extraordinarily beautiful, La Jolla Cove is one of the most photographed shorelines in Southern California. Because it is a protected Ecological Reserve, marine wildlife abounds. Water visibility at the Cove can sometimes exceed 30 feet, making it a very popular spot for Scuba, snorkeling and kayaking. Shopping in La Jolla tends toward the unusual and upscale; designer fashions, expensive jewelry, ethnic artifacts, priceless antiques, oriental rugs and exotic cars. Prospect Street is the spot for fine-dining, including many five star options perched overlooking the ocean. The most popular offerings are fresh seafood and Mexican cuisine, but you can find anything from scrambled eggs to sushi among the many and varied eateries throughout La Jolla. Ask your Bluewater Concierge for suggestions. We'lll find just the right place for your palette! With its spectacular coastline, temperate climate and dramatic views, it's no wonder that La Jolla was one of the first San Diego neighborhoods to be settled, and has since become home to some of the most prized and expensive real estate in the nation. Surrounded on three sides by the sea and backed by the steep slopes of Mt. Soledad, La Jolla has a Mediterranean feel and enjoys a unique microclimate which rarely drops below 50 degrees or exceeds 90 degrees. We welcome you to experience all that La Jolla has to offer and be our guest at Casa de las Olas. We have another cottage, Casa del Sol, in the same location in case you have more in your group. 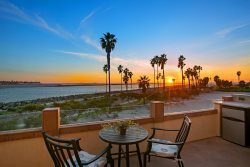 Call the Bluewater Vacation Homes team for help finding the perfect home for your group or for assistance planning your vacation to San Diego. Once you arrive, our guest services team is available 24/7 to ensure you have an exceptional experience. Only steps away from The Village – a bustling business district offering world class dining, one-of-a-kind boutiques, art galleries, jewelry shops and romantic, old world hotels. The surrounding residential community is a charming mix of turn-of-the-century Spanish architecture, eccentric modern designs and everything in-between. Thank you Bluewater Vacation Homes fir providing a great property. This quaint beach cottage is perfectly located just steps from the beach and has a Pacific view. Super clean and nicely stocked for your stay. I love the vintage kitchen appliances and the decor throughout. Also has a new full size washer and dryer. Highly recommend this place for a romantic getaway. When I called the office for any issue the staff was very professional and friendly. I said this under #15. Blue Water Vacation Homes handled our reservation expertly and were very responsive to our questions. The ability to have groceries left in the house prior to our arrival was a great touch. We'd definitely rent with them again. This is the perfect little beach house. Wonderful view of the ocean (bright and airy) and exceptionally convenient to shops, restaurants etc. Although it doesn't come with parking, we had no problem finding off-street parking. We loved our stay and would recommend it for a couple. Exceptional experience! The cottage is beautifully decorated and maintained. We had a little glitch with keypad but it was handled so well that it added to our experience. Can't beat the location. Great value! Bluwater was attentive and easy to contact. Stephanie and Jolene were excellent hosts! This is a lovely little well-built home from the thirties. Its a real little classic that is wel-maintained and updated. Wood floors, skylights and a modern retro kitchen made our stay so very enjoyable. The view for the price was superb. Wed love to stay here every year! Lovely stay, only had four hangers when we arrived but within an hour we had plenty more. Thank you for your speedy response! Lovely property, perfect for two. Wonderful views, great to have a washing machine and tumble dryer. Cute little cottage and just steps from the ocean, restaurants and shops. Bluewater Vacation Homes was a great find. Though we didn't have a lot of contact with the staff, other than email, what contact we did have was professional and friendly. We stayed in this property for two weeks. We really enjoyed being so close to the ocean. We spent one whole week on the beach swimming, sunbathing, and reading. Having the home so close by, we were able to have picnic lunches and daily evening walks to the Cove for beautiful sunsets. There are a million restaurants within walking distance and so much to see and do. A wonderful place to just unwind and relax. We will definitely book this home again in the future. Couldn't have asked for an easier rental experience. Thank you so much. Great experience ~ we would recommend and look forward to booking again! Very professional.Renters needs first and foremost. Perfect. - Ideal for two people. Might be a little cramped with four. Perfect place for really experiencing La Jolla! Precious cottage that is perfect for two. Awesome location is steps from La Jolla Cove and downtown shops. Loved it! Parking in summer might be a challenge but there is a public lot a few doors down. Wonderful location, great views, easy check-in and cute well equipped home. Thanks so much. Reviewer Location: Dallas, TX - Date of Arrival: February 23, 2016 - Review#: 14183069 - "Perfect Bungalow" - Review Rating: 5 out of 5 stars - Review: "My husband and I stayed here for our anniversary. It's absolutely perfect! Great location, high quality and cute decorations, more than necessary accommodations with the kitchen, and great amenities. We've already recommended it to all our friends and family and will definitely be back. Our only complaint was that the windows were dirty and it made our amazing view a little less great. However, that is such a small complaint. Great spot for a couple!" - BW reply: "Hello Whitney! Thank you so much for your kind words and know that it was such a pleasure hosting you both for your anniversary. It really is the perfect getaway cottage! In the future, let us know if you have any concerns, Bluewaters team is happy to schedule for you any unforeseen maintenance or a window cleaning after a rain (rare out here in sunny San Diego!). We all look forward to hearing from you for a repeat stay." Reviewer Location: Hawthorn Woods, IL - Date of Arrival: December 4, 2015 - Review#: 13728164 - "Beautiful cottage by the Sea" - Review Rating: 5 out of 5 stars - Review: "Our first time coming to LaJolla. We celebrated our second honeymoon here. Great location. Beautiful water views and wonderful sea breeze. Quiet, which was important to us since we ran around all day. Very comfortable and cozy cottage. Loved watching the sunset, the seals, the seagulls and the surfers. Wonderful dining around the corner. I would highly recommend Cody's - their french toast was to die for!!. The management company was very responsive to any and all minor needs. Our enjoyment in this cottage was their priority. To find this cottage, Ocean Lane is a set of stairs. So when you drive over, look up the stairs and you will find the cute cottage. We would recommend this to our friends and family and hope to get to enjoy this again. December was the perfect time to go - all the popular attractions were available with no lines and no waiting. Street parking only, but it was very doable. Most of the time, we got a spot right in front of the cottage. You may not want to sleep too late, because city garbage trucks come by early. Perfect place if you want to have the water view and beauty without being surrounded by tons of people."